Here is the list of the hotels near Bannes. Book your hotel near Bannes today, Thursday 16 May for the best price, reservation and cancellation free of charge thanks to our partner Booking.com, leader in on-line hotels reservation. Below here is the list the 50 closest hotels of Bannes, sortable according your criteria. You will find the position of these accommodations on the Bannes hotels map. Situated in Terrou, Holiday home La Remise features a private pool. This holiday home provides barbecue facilities as well as a terrace. This holiday home has 7 bedrooms, a TV, and a kitchen with a microwave and a fridge. The holiday home offers an outdoor pool. Holiday home La Remise offers a children's playground. Rocamadour is 42 km from the accommodation. Aéroport d'Aurillac Airport is 51 km from the property. Bed and Breakfast Lacam-dʼOurcet Preferred hotel ! Set on a hill with panoramic countryside views, 30 km from Padirac and 45 km from Rocamadour, Ferme Bout de Cote offers bed and breakfast accommodation with free Wi-Fi. An American breakfast is served in the morning, including cakes, bread, pancakes, cheese, jam, hot drinks and juices. Evening meals are also available on request, with organic ingredients from the property’s garden. Special diets can be catered for on request. The bedrooms have been built in an old barn with ecological techniques and materials. With views of the valley, they have a welcome tray, a private shower room and private toilet. There is also a common lounge with a TV, books and games. There is a wellness room at the property and massages can be arranged at an extra cost. There are many hiking and cycling trails around Ferme Bout de Cote. Castelnau Castle is 12 km from the property and Tolerme Lake with a beach and restaurants can be found 8 km away. There is free on-site parking at the farm. House L'oustal is located in Lacam-dʼOurcet. The holiday home features garden views and is 43 km from Rocamadour. The holiday home has a TV. A dishwasher, a microwave and a fridge can be found in the kitchen. Figeac is 40 km from the holiday home. Aéroport d'Aurillac Airport is 47 km from the property. Situated in Anglars, Le Tilleul features accommodation with a terrace and free WiFi. Guests staying at this holiday home have access to a fully equipped kitchen. The holiday home comes with a flat-screen TV and 3 bedrooms. Rocamadour is 27 km from the holiday home, while Figeac is 23 km away. Brive Dordogne Valley Airport is 59 km from the property. Le Figuier is located in Anglars. The property has garden views and is 27 km from Rocamadour. This holiday home is fitted with 3 bedrooms, a TV, and a kitchen. The holiday home offers a terrace. Guests can also relax in the garden. Figeac is 23 km from Gîte rural. Brive Dordogne Valley Airport is 59 km from the property. Bed and Breakfast Lacapelle-Marival Preferred hotel ! Featuring free WiFi and a sun terrace, Ecuries de Saint Maurice is located within a former farmhouse dating back to 1898, set in a 4.5-hectare park with horses, in Lacapelle-Marival. A welcome wine glass is served and homemade dinners can be shared on site upon prior booking. Every room is equipped with a flat-screen TV, free WiFi access and has a shower room with private toilet. You will also find a coffee machine, kettle and fridge in your room. Some units have a seating area to relax in after a busy day. You will find a shared lounge at this property with a TV, a refrigerator, a coffee machine and a kettle. Breakfast is served every morning. Rocamadour is 25 km from Ecuries de Saint Maurice, while Conques is 40 km from the property. Free private parking is available on site. House Gite le 18-72 is situated in Lacam-dʼOurcet. The holiday home features garden views and is 47 km from Rocamadour. The holiday home has a TV. The accommodation is fitted with a kitchen with a dishwasher and fridge. Figeac is 40 km from the holiday home, while Gramat is 38 km from the property. The nearest airport is Aéroport d'Aurillac Airport, 50 km from House Gite le 18-72. Offering free WiFi and mountain views, Three-Bedroom Holiday Home in Lacapelle-Marival is an accommodation located in Lacapelle-Marival. The accommodation is 31 km from Rocamadour. This holiday home comes with a living room and a fully equipped kitchenette. A TV is available. The holiday home offers an outdoor pool. Figeac is 21 km from Three-Bedroom Holiday Home in Lacapelle-Marival, while Saint-Cirq-Lapopie is 50 km away. The nearest airport is Aéroport d'Aurillac Airport, 61 km from the accommodation. Situated in the medieval village of Lacapelle Marival, Hostellerie La Terrasse features a restaurant with panoramic views of the Cardaillac Chateau. It offers regional cuisine and is set in beautiful gardens. All the rooms at Hostellerie La Terrasse are equipped with a private bathroom, TV and Wi-Fi access. Guests can relax in the hotel’s cozy lounge with a fireplace and bar, or on the garden terrace. The La Terrasse restaurant is decorated in an elegant style with antique wooden furnishings. Gastronomic cuisine is served with regional specialities such as foie gras. Half way between the rivers of the Lot and the Dordogne, Lacapelle Marival is nestled within the green valleys and wooded hills of the surrounding region. Activities available include hiking, fishing and cycling. House La chayrie is set in Lacapelle-Marival. Guests staying at this holiday home have access to a fully equipped kitchen. The holiday home is fitted with a TV. Rocamadour is 31 km from the holiday home. The nearest airport is Aéroport d'Aurillac Airport, 62 km from the property. Set in Lacapelle-Marival, Le Lac Bleu provides accommodation with free WiFi and access to a garden. All of the units feature a private bathroom, flat-screen TV and fully-equipped kitchen. A dishwasher and oven are also featured, as well as a coffee machine and a kettle. The holiday park offers a seasonal outdoor pool. A children's playground can be found at Le Lac Bleu, along with a terrace. Rocamadour is 32 km from the accommodation, while Figeac is 22 km from the property. The nearest airport is Aéroport d'Aurillac Airport, 62 km from the property. House Le petit rouby is situated in Rudelle. The accommodation is 25 km from Rocamadour. The holiday home comes with a TV. A dishwasher and a microwave can be found in the kitchen. Figeac is 20 km from the holiday home, while Saint-Cirq-Lapopie is 49 km away. Brive Dordogne Valley Airport is 57 km from the property. House Les barrières is set in Labathude. The property has garden views and is 36 km from Rocamadour. The holiday home features a TV. The kitchen comes with a fridge. Figeac is 23 km from the holiday home. The nearest airport is Aéroport d'Aurillac Airport, 56 km from House Les barrières. Located in Lacam-dʼOurcet, Chambres d'hôtes Fleur de Lis offers accommodation with a terrace and free WiFi. This bed and breakfast features barbecue facilities, a garden, as well as a bar. A continental breakfast can be enjoyed at the property. The bed and breakfast offers a children's playground. Guests at Chambres d'hôtes Fleur de Lis can enjoy table tennis on site, or fishing in the surroundings. Aurillac is 49 km from the accommodation, while Figeac is 35 km away. The nearest airport is Aéroport d'Aurillac Airport, 45 km from Chambres d'hôtes Fleur de Lis. Featuring free WiFi, an outdoor pool and a seasonal outdoor pool, Domaine Les Teuillères offers a Bed & Breakfast accommodation, located in a small campsite in Lacam-d’Ourcet. Free private parking is available on site. Certain units include a seating area for your convenience. Enjoy a cup of coffee or tea while looking out at the lake or garden. All rooms come with a private bathroom equipped with a bath or shower. For your comfort, you will find free toiletries and a hairdryer. You can play table tennis at the bed and breakfast. 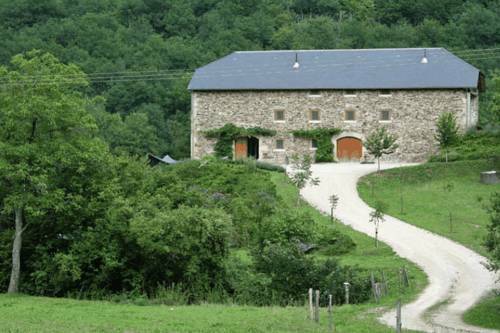 Rocamadour is 34 km from Domaine Les Teuillères, while Conques is 39 km from the property. The nearest airport is Aéroport d'Aurillac Airport, 31 km from Domaine Les Teuillères. Guest accommodation Lacam-dʼOurcet Preferred hotel ! Situated in Lacam-dʼOurcet, Gîte Fénil Dans Le Lot Avec Vue Panoramique provides accommodation with seating area. Complimentary WiFi is offered. All units come with a balcony with pool views, a kitchen with a dishwasher and an oven, and a private bathroom. A microwave, a fridge and stovetop are also provided, as well as a coffee machine and a kettle. There is an on-site restaurant, which serves a variety of French dishes. The holiday home offers a seasonal outdoor pool. There is a playground on site. Aurillac is 49 km from Gîte Fénil Dans Le Lot Avec Vue Panoramique, while Figeac is 35 km away. Aéroport d'Aurillac Airport is 45 km from the property. Located in Gorses, House L'ormerée features accommodation with a private pool. Guests staying at this holiday home have access to a fully equipped kitchen. The holiday home is equipped with a TV. Aurillac is 48 km from the holiday home, while Figeac is 33 km from the property. The nearest airport is Aéroport d'Aurillac Airport, 44 km from the property. Below here is the hotels map of Bannes. Names and details of Bannes hotels can be shown on the map clicking on the prices icons.